This ground level, 1 bedroom, 1 full bath Purgatory Townhome is located at Purgatory Resort only a short 5 minute walk to the Express Lift and ski plaza. Enjoy all the outdoor activities offered close by including snow mobiles, cross country skiing, snowshoeing, hiking, mountain biking and horseback riding. With 2 queen beds in the bedroom and a queen sleeper sofa in the living room the condo easily sleeps 6. The 2 patios offer views of the West Needles Mountains. Relax in front of the wood burning fireplace after a day of playing in the Colorado Mountains. 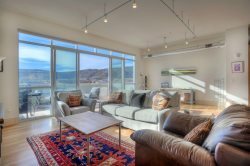 This condo is updated and comfortable and cozy with great views of the west Needles mountains. Enjoy the peaceful quiet of the surrounding San Juan Mountains. Or play hard on the fantastic mountain bike, hiking and horseback riding trails just minutes away. Take a drive on the San Juan Scenic Highway and visit Silverton, Ouray or Telluride. Take a day to visit Mesa Verde National Park or ride the Durango Silverton Train. Visit Durango for great shopping and fabulous restaurants. Soak in the natural springs at Trimble Hot Springs. It's all here for you to enjoy the perfect vacation. A great location for a vacation any time of year. No outdoor fires or charcoal grills Surface Parking lot parking available. In winter only ONE car allowed and a parking pass is provided. No Trailer parking. Very accessible and great overall experience! Love it! Was perfect for our family of 4! It was great. I had my service dog with me and leashed and always curbed her when walking her. We did see at least four dogs off leash behind the condo, with no one in sight and they were not curbed. The team is responsive in timely and courteous way. This is second time visiting the same place and we will be back again! hot water heater didn't seem to be large enough for the 4 of us. One or 2 of us would run out of hot water (when we all tried to take a shower one right after the other. Other than that, the condo was great. It met our needs for a conveniently located condo within walking distance of the slopes. This is a perfect place to stay for skiing with a family of 6. Everything was nice and clean. And, it was so close to the ski area! Adequate except we didn't get the TV working. Would have been better to offer live assistance. This was a nice size property and comfortable for 2-4 people. However, the sofa sleeper was very dirty when opened it up and could not be used. The living area pillows shed feathers. The kitchen was well supplied, and the bedroom was spacious. Not enough clean washcloths. Suzanne was fantastic. Her response time was great. Besides the water leak - the stay couldn't have been much better.